Rice pudding happens to be one of my favorite comfort foods. I've tried out several different versions but never realized that the dish is a popular Mexican dessert called Arroz con Leche. 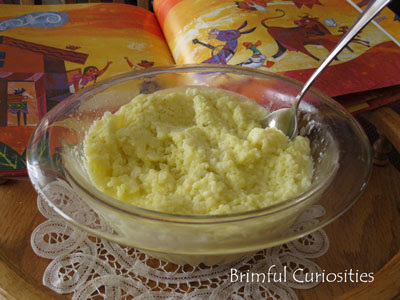 In fact, different versions of rice puddings can be found all around the world! Making rice pudding on the stove-top is a slow process that takes patience and involves frequent stirring until the pudding thickens, but the end result is so worth the time and effort. The pudding tastes fantastic served either warm or cold, and it is a yummy treat to eat year round. This is the cow / that made the fresh milk / while teaching the CABRA / that churned the CREMA / to make the MANTEQUILLA / that went into the CAZUELA that the farm maiden stirred. 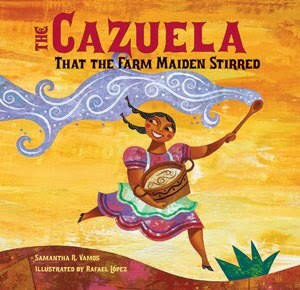 Samantha Vamos, in her newest bilingual picture book, cleverly combines both Spanish and English words together to tell the story of a farm maiden who makes a delicious batch of Arroz con Leche in a big pot (the cazuela). 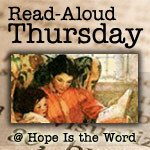 With the help of several helpful farm animals and a farmer, she adds all the rice pudding ingredients in a pot. While waiting for the pudding to cook the whole colorful group of characters dance and play instruments and they forget to tend the bubbling, burbling pot. Ay! Apparently the farm maiden needs to stir her pot more often. Who knew that making a pot of rice pudding could result in such a fantastic, flavorful fiesta? Much like in the familiar tale The House That Jack Built, Vamos' cumulative story builds and builds upon itself as each ingredient gets added to the simmering pot. The repetition and sequencing really helps young readers learn new animal and cooking themed Spanish words like cow/vacha, goat/cabra, duck/pato, donkey/burro, milk/leche and egg/huevo. Each new term is first introduced in English and then appears in the following verses in Spanish. 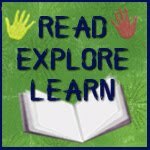 A glossary in the back of the book provides a helpful pronunciation key and printable flashcards can be found online in the Activity and Discussion Guide. My kids use the flashcards to interact with the story and place the cards on the floor sequentially as I read the cumulating verses. I honestly don't think Vamos could have found a better suited illustrator for her book than Rafael López. He creates his bold, vivid illustrations by painting with acrylics on grained wood. His illustrations infused with orange-red backgrounds perfectly parallel the story. The pictures build in excitement, exhibit movement and vibrancy and López evens adds in a dash of humor. We own Vamos' other bilingual book, Before You Were Here, Mi Amor, and I adore how the talented author seamlessly blends both English and Spanish together in her books. If you are trying to teach your child basic Spanish terms, I highly recommend both of Vamos' lovely picture books. And for libraries that are using the Collaborative Summer Library Program, this is a great book for this year's theme, One World, Many Stories. Like I said, rice pudding seems to be a popular dish worldwide. The book includes a recipe for Arroz con Leche, and of course we tried it out and made sure to use the Spanish words for the ingredients as we added them to the pot! This version contains eggs and butter and is a bit heavier and richer than the recipe I normally use. It is also a little more complicated to make. My son says it tastes like custard ice cream. While it's not my favorite, I do love the addition of the lime zest. It adds a very light, refreshing edge to the dish, and I will certainly add lime or lemon again next time I make a batch of rice pudding. 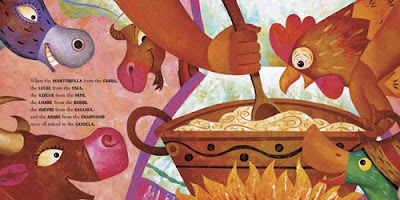 A fancy cazuela (cooking pot) appears frequently in the illustrations of the book, The Cazuela That the Farm Maiden Stirred. My son and I crafted our own version of the cooking pot out of a square 12" x 12" piece of brown scrapbook paper. 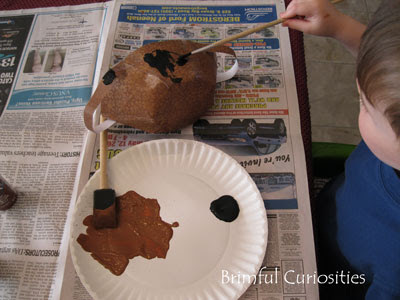 I considered trying to make a paper-mache bowl, but this taped paper bowl takes a lot less time to construct and doesn't create as much mess. 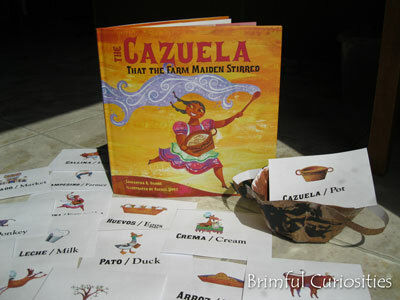 Now we can add our flashcard ingredients to the cazuela as we read the story together. 1. 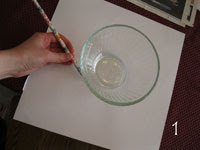 Find a small bowl (we used a 3 cup Pyrex) and trace the bottom of the bowl on the center of the square paper. 2. 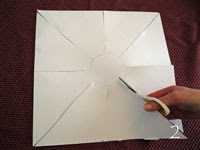 Use a scissors to cut six symmetrical lines that radiate outward from the circle drawing. 3-4. 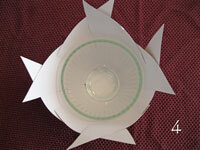 Center the bowl on the paper and fold and layer the around the bowl using the shape of the bowl as a guide. Secure the flaps together with clear tape. 5. 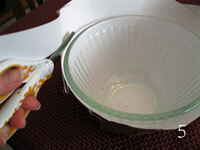 Cut the top of the bowl uniformly with a scissors. 6. 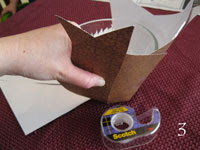 Attach two paper handle strips with tape to the sides of the bowl. Paint the bowl as desired. Got my Round Robin up now with the blogger mess. If you would love to post this great post.. Have a great weekend.. Thanks for linking this up.. Have a great day..